De Parade is a popular yearly theater festival with focus on food and drinks. The shows take place in tents, built around a central market square of bars and restaurants. The main event takes place in the summer in Martin Luther King park. Since it’s so popular, the organizers have added a winter edition. 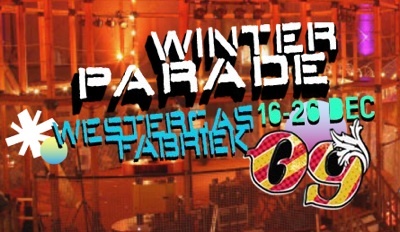 Winter Parade will be held in the Westergasfabriek from December 16 to 26. The format is slightly different in the winter due to the restricted space indoors. Instead of being able to choose your shows, you will buy one ticket for general admission and all shows of the evening. Food and drink is extra and like in the summer, there is an interesting kitchen lineup including an oyster bar, a stamppot kitchen and a slow food central. I will be in Holland for 6 weeks and Im so glad I found your site. Will check out this festival for sure and get some of that dutch culture! Super exciting for you to spend 6 weeks exploring Holland. I’m sure the Winter Parade will be a good sampler. Too bad you won’t be around for the larger summer edition. Have never been there, but heard that Singapore has great food. Hope you like my suggestions! I love reading about all the food here. I actually have a high raw vegan diet but ocassionally eat chips (my weakness!!). I cant wait to try REAL chips (or as you might call them, fries) in Holland. I’m also very excited about going to some raw cafes in Amsterdam. Hey maybe I’ll review them and you can read that. I tried to access the winter parade site but its all in dutch. Not sure where to get tickets. p.s. Singapore is wonderful. I eat fantastic food here everyday. Fresh tropical fruits are so good here too. Yeah, sorry, indeed all in Dutch only. The site says that online ticket sales start on 16 December. The menu has a link “KAARTVERKOOP” (kaart = ticket, verkoop = sale) which supposedly let you purchase tickets online as of 16 December. Will definitely keep an eye on your blog to check for Amsterdam reviews. Curious which places you like. I’ve been talking about to other food bloggers about guest posts. That could be fun, too.